On Wednesday, September 27, 2017, John Williams conducted the Seattle Symphony in a sold-out performance devoted largely to music from the films of Steven Spielberg — who made a surprise appearance to narrate the second half of the concert. In an exclusive for Variety, Jon Burlingame reports that Alan Silvestri will score Steven Spielberg’s Ready Player One, while John Williams will score The Papers, as both films will be in post-production simultaneously. On Tuesday, April 4, from 8:00 p.m. to 11:00 p.m. PDT, John Williams joins Jim Svjeda on the KUSC-FM Evening Program to discuss the new album John Williams–Steven Spielberg: The Ultimate Collection. 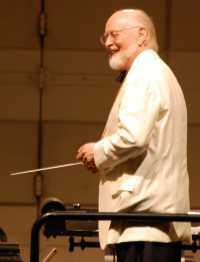 To celebrate John Williams’ 85th birthday, the Boston Pops will dedicate their 2017 spring season to their esteemed conductor laureate. On April 7 and 8, 2017, prior to the official beginning of the Pops season, the orchestra and music director Keith Lockhart will record two pre-season concerts for a live album featuring selections from Williams’ lesser-known scores (including The Towering Inferno and Goodbye, Mr. Chips). Williams himself returns to the Pops (sharing the podium with Lockhart) for Film Night concerts on May 31 and June 1. Lockhart will also conduct live-to-screen presentations of E.T. (May 12 & 13) and Jaws (May 25 & 26) as well as a full program of Williams selections (May 16 & 24). Elsewhere on the Tanglewood schedule, Williams will conduct music from Jurassic Park, Minority Report and Jaws at the August 1 Tanglewood on Parade concert. For the annual Film Night at Tanglewood event on August 19, Williams will conduct music from the Harry Potter films, E.T., Far and Away and Lincoln, while Nelsons will lead music by Erich Wolfgang Korngold, Bernard Herrmann and Alex North. On June 18, Keith Lockhart conducts the Boston Pops Esplanade Orchestra in a live-to-picture presentation of Jaws, and on August 25 Lockhart and the Boston Pops present a live performance of E.T. the Extra-Terrestrial. 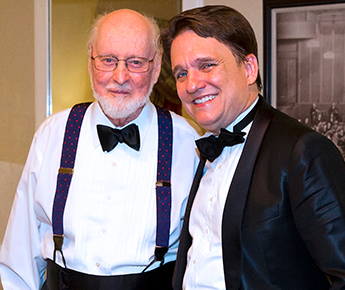 On Labor Day weekend (Friday, Saturday and Sunday, September 2–4), John Williams made his annual appearance at the Hollywood Bowl, conducting the Los Angeles Philharmonic in selections from The Force Awakens and other films in the Star Wars saga — along with the West Coast premiere of his Suite from The BFG. On the first half of the program, conductor David Newman led the Philharmonic in other film music favorites, including Williams’ theme from Sabrina. 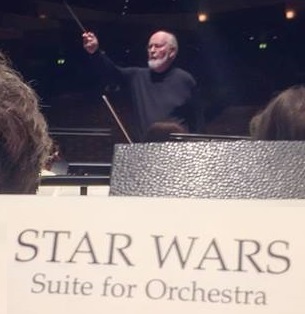 A current sale on orchestral music and scores at online retailer Sheet Music Plus applies to all of the John Williams Signature Edition scores and orchestral parts, providing savings of 20% over list prices. 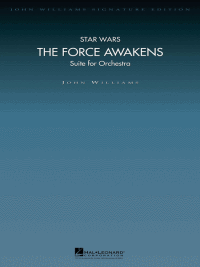 This includes the newest addition, John Williams’ Suite from The Force Awakens (Hal Leonard 4491706). 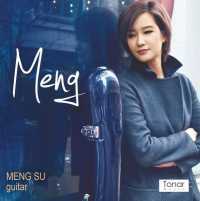 Guitarist Meng Su’s first solo CD, Meng (Tonar Music TON-CD-MENG), features a recording of John Williams’ 2012 work for solo guitar, Rounds, as well as a sonata by Mario Castelnuovo-Tedesco (with whom Williams studied composition during the 1950s) and works of J.S. Bach, Francisco Tárrega and William Walton. According to The Baltimore Sun, she “brings a particularly sensitive touch to a darkly beautiful theme from John Williams’ Munich film score” (“Avner’s Theme”).